The Showers Pass Storm Jacket offers waterproof protection and comfortable breathability at an affordable price. They've taped the seams to prevent leaking, added an extended drop tail for extra coverage, plus a large rear vent and two way front zipper for additional airflow. A fleecy collar and elastic cuffs keep the fit comfortable and secure. 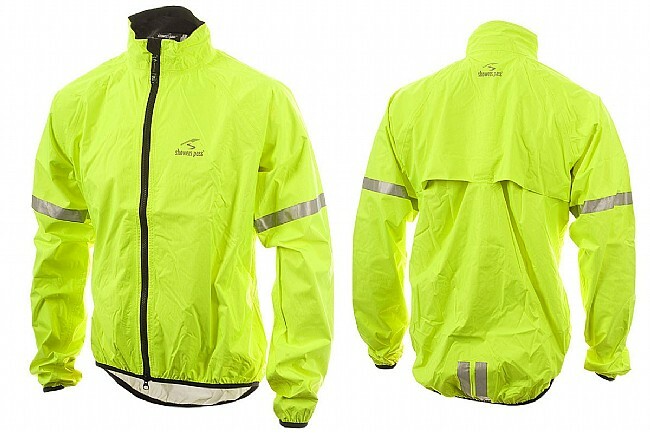 Available in Neon Yellow with 360 degree reflectivity to keep you seen out on the road. Early morning rides in the tule fog and late night jogs on country roads are two reasons I purchased this jacket. It keeps the damp cold out and blocks the wind. It keeps the core heat in. I will usually use the two way zipper to open it up and push the sleeves up to prevent swamping in my own body soup. I love the reflective quality for night jogs but I heat up quick. I can remove it and stow it in the included mesh carrying sack. It was affordable and it was another value added purchase from Bike Tires Direct. It's bright, it packs down to the size of a water bottle, and it's pretty breathable. When it was cooler, I used it as a shell in the mornings to block wind and it did fine. In moderate temps, my torso managed to stay fairly dry, but my arms were still all sweaty. I'd say this jacket breathes better than most, but it still tends to hold some heat and moisture. I haven't ridden it in hot weather, but it would definitely be a sauna inside I'm sure. It's more of a cool weather jacket, or out shell for very cold weather. If you need rain gear for summer for anything more than an occasional rain, you'd better invest in a lighter membrane layer. Still, good construction. Great fit. Decent, maybe just above average breathability. I had been getting by with a low cost department store raincoat for several years, but decided to get a better one specifically for biking in wet weather. I liked the look of this one so I put in my order and got one. I was surprised at how light weight it is. It stuffs into an included stuff sack, and takes up little room. Just wore it for the first time, Saturday. Extremely light weight, yet very strong with good ventilation from back vents. I've worn other rain jackets that didn't have anywhere near the features this one has.The fabric is very lightweight, yet is also very durable. I vey much like the back vents that allow the jacket to breathe while still maintaining the rainproof quality I was looking for.I can see that I'll be wearing thhis jacket for a long time to come. And the high visibility yellow is awesome. I definitely got my money's worth!